Johnny Chambers joined the Navy in 1964 at age 19. He served eight months in Vietnam, where he witnessed horrific events in combat. Like many who serve in war, his trauma followed him home. He suffered from then-undiagnosed post-traumatic stress disorder (PTSD). As a result, upon returning to the U.S., Chambers began to drink and went AWOL on several occasions. In 1970 the military discharged him with an Undesirable discharge, a typical response at the time. Chambers struggled with substance abuse, relationships and employment. Without an Honorable discharge, he had no access to veterans benefits such as the VA healthcare system, the GI Bill, disability benefits and VA home loans. He lived with that status for decades and had little chance of seeing it change. 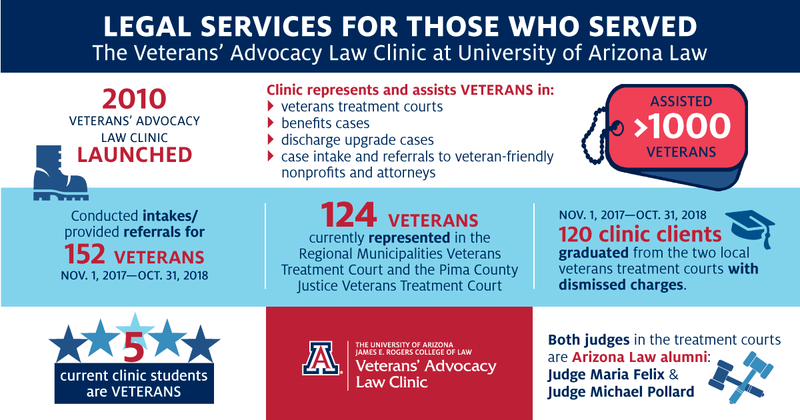 That’s where the Veterans’ Advocacy Law Clinic at the University of Arizona James E. Rogers College of Law stepped in. Professor Kristine Huskey had been leading the clinic for about one year when she decided to have students begin working on discharge upgrade cases. They previously had exclusively assisted servicemembers in Veterans Treatment Court, but the Honorable Gregg Maxon, a retired brigadier general, encouraged Huskey to take on discharge upgrade cases because few attorneys in Arizona were doing that work, and no one was doing it pro bono. In March 2014, the clinic participated in a one-day clinic hosted by the Arizona Disabled American Veterans and the University of Arizona Veterans Center. There they met with veterans who were interested in having their discharge status upgraded. Johnny Chambers filled out an application along with about a dozen other veterans. The clinic arranged for a local VA psychologist to evaluate Chambers, and his PTSD was finally diagnosed. The students discovered that Chambers had an application for discharge upgrade that had been filed by a previous lawyer, but they were unable track down its status, so in May 2015 they filed a new application from the clinic. One week later, they received a decision from the Board for Correction of Naval Records—albeit the decision was in response to the previous lawyer’s original application. The request for a discharge upgrade was denied. Because the board had made its decision based on the other lawyer’s original application, the clinic students requested the board view their application as a reconsideration. The clinic application—a 30-page memo with numerous exhibits—was much more thorough than the original and included the crucial new information about Chambers’ PTSD diagnosis. New guidelines had just been issued to the military boards, requiring liberal consideration in upgrade cases if applicants had PTSD. The board agreed to reconsider, but in December 2015, the clinic’s application was denied. “That just charged us up and made us work harder to prove that they got it wrong,” Huskey says. In 2017, the clinic filed a complaint in the U.S. District Court for the District of Tucson, suing the secretary of the Navy. Students negotiated an expedited remand with the assistant U.S. attorney, which the court granted, and allowed students to draft a new brief to the board. “We got the government to agree that it had to be decided within 180 days, because these boards are taking two years to decide a case,” Huskey says. Finally, in September 2018, within days of the deadline, the decision was released. The board granted Chambers an Honorable discharge. Chambers received news of his new upgraded status from current 3L student Donald Walton, a retired Navy veteran. “I think they did a great job with all they did. It means a lot,” Chambers says. For 3L Walton, the teamwork he has experienced in the Veterans’ Advocacy Law Clinic is connected to his time in service. A total of 10 students worked on the Chambers case—researching; drafting declarations, briefs, the complaint, and joint remand; and negotiating with the assistant U.S. attorney—over the span of eight semesters and three summers. Huskey has heard from every student who worked on the case, including recent graduate Zoey Kotzambasis (’18). “So many students worked so hard with our professors on the case, and it's just awesome to see your team's work pay off in such a huge way for such a deserving client,” says Kotzambasis, who worked in the clinic for three semesters. Huskey says that combination of bonding with one client over a long period of time and working on important lawyering skills such as research, fact investigation and development, and writing makes the Veterans’ Advocacy Law Clinic a deeply meaningful experience for the students who participate. Class of 2015 graduate Hubbard says her time at the clinic fortified her commitment to pro bono work. Visit the Veterans’ Advocacy Law Clinic website to learn more about their work.